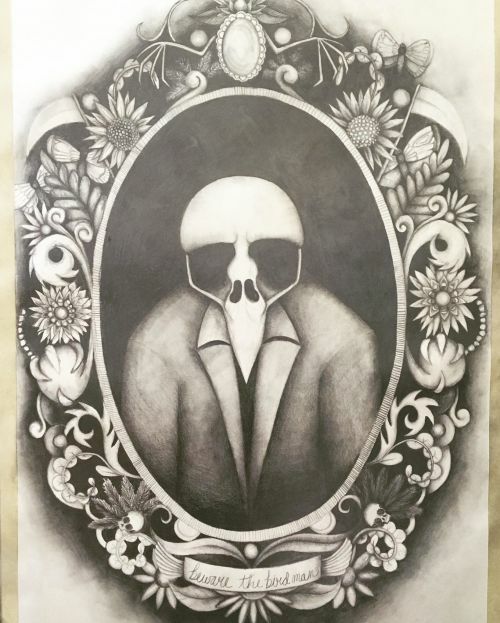 For the month of October, Fargo’s Red Raven Espresso Parlor will feature the work of local artist Morganne Behl, whose ink, graphite, and colored-pencil sketches are a perfect fit for the Halloween season. This horror-themed exhibition will contain at least fourteen framed drawings, featuring images of skulls, bees, and bird demons. Among the most intriguing of Behl’s pieces is “Bird Man,” a graphite sketch that took six months to complete. Though original drafts of this creature were more animal-like in appearance, with wings and horns, the final result is a portrait of a humanoid demon with a bird skull for a head. The exhibition will feature another graphite piece called “Eviscerated,” which Behl completed as a follow-up to “Bird Man” over the course of four months. This sketch shows a woman being attacked by large bird talons, with one set of talons covering her mouth while the other tears through her throat. As an artist, Behl is largely self-taught, having had limited formal education when it comes to visual art.